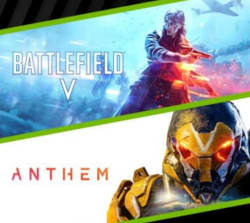 HP offers downloads of Anthem for Windows or Battlefield V for Windows for free when you purchase a select HP gaming desktop PC featuring an nVidia GeForce RTX 2080 Ti, 2080, or 2070 graphics card. Instructions on how to redeem the game will be sent within 30 days of purchase. Deal ends February 26.